Heaven—It's an Amazing Place and It's Your Home! C.S. Lewis once said that the Christians who have the most influence on this world are the Christians who think the most of the next world—Heaven. You can change your world by understanding one of the greatest blessings of your Christian life, your future home with God. 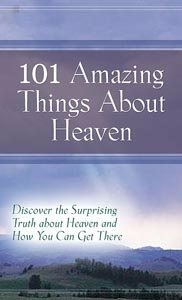 101 Amazing Things About Heaven offers familiar, surprising, humbling, inspiring, and amazing facts about Heaven, accompanied by a scripture and an insightful reflection. Learn about the wonders of Heaven and strengthen your faith through this life-transforming collection of facts about the greatest neighborhood you'll ever live in: Heaven. Heaven—It's real and God wants you there!